The One and Only Ivan -- What's in a Name? A brief writing prompt for students reading The One and Only Ivan by K. A. Applegate. 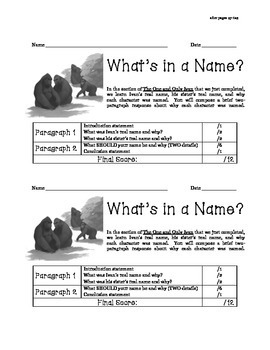 The prompt asks students to explain the importance of two of the characters names, and to create a name for themselves, based on their personality traits. Incorporates writing from sources, and creative writing. Rubric included. Enjoy!